As you might expect from a $6 downloadable PlayStation Vita title, Draw Slasher doesn’t feature a sprawling narrative that sets up a story for the ages. Instead, you see a ninja named Hanzo walking home from Summer Camp, who is then quickly attacked by Pirate Monkey Zombies. As I indicated in the opening, there isn’t much to Draw Slasher, as you mostly just get a bare bones story of a man whose town was attacked by Pirate Monkey Zombies. There’s a little jawing between you and the handful of bosses you come across, but it’s usually filled with broken English, and most comedic attempts miss more times than they hit. If the name of the game wasn’t a dead giveaway, you use your finger to draw lines on the PlayStation Vita screen, slashing enemies in the process. Beginning with basic enemies who take a single slash, you quickly evolve to tougher enemies who can take multiple hits before they die (swiping wildly is a suitable strategy), then other zombies who require you to strike a certain area of their body or attack them from behind. The issue I found with Draw Slasher is that while they do introduce new enemies often, only a couple are actually challenging, while the rest are annoying. For example, you have a female enemy who you are forced to chase back and forth three times to tire her out, strike her, then repeat the process. Because she runs out of the screen, you must run after her for longer than you should, something I grew tired of quite quickly. Just for Draw Slasher, I’ve added this new category to the review format. Controlled solely with the touch screen, I found that it does work well the majority of the time, but when things get hectic or you need precise movements, the problems pop up. Due to my index finger not being tiny, trying to move to an exact location in a small area without getting hit was a very difficult task, leading to me getting hit or put on fire multiple times. Slashes also don’t always register, something unrelated to my, or any, finger size. Rather than getting the full attack I normally would, the slash would only end up being half of what I drew, leading to missed attacks. On the surface, really good. The colors pop, the enemies are animated quite well, and the blood splashes. It isn’t until you advance a little before you notice that the backgrounds are recycled quite often throughout the adventure. That visual faux pas aside, Draw Slasher looks pretty darn good. The main storyline took me under 2 hours to complete, so it isn’t very lengthy. Past that, you can replay the campaign on a tougher difficulty with the New Game+, with over an hour of challenges and arcade modes before you’ve seen everything Draw Slasher has to offer. Well, this obviously depends on your difficulty choice, but provided you pick normal, it’s a pretty straightforward way through until the end. You’ll die a few times along the way thanks to a couple challenging areas, but nothing you can’t overcome with a little patience. Kind of. Using your fingers to draw lines and slash a whole bunch of enemies is satisfying, and the addition of new enemies keeps it from getting too stale on that front. There’s also the fast-paced gameplay, which doesn’t give you much downtime, meaning that you stay engaged throughout the campaign. Unfortunately, you are just swiping or tapping your finger on the screen to do the same few tasks over and over again, so it does become repetitive at times. A couple interesting boss fights do help to break this up though. At $6, it’s a little difficult to recommend. If Draw Slasher had debuted at something like $3, the price would be a non-issue, but since it didn’t, I’d suggest waiting until it goes 50% off. 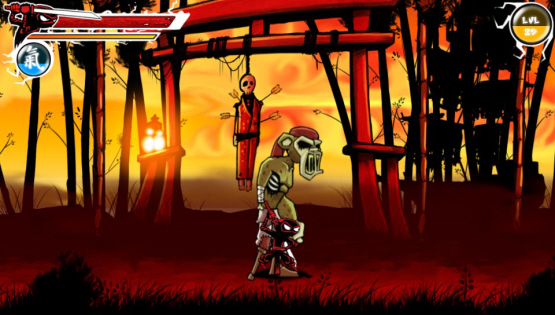 Provided you haven’t driven yourself mad with the many touch slashing games already available on a multitude of touchscreen devices, Draw Slasher is a serviceable game to help you spend a few hours killing enemies with your fingers. Like I said though, you should wait for a sale because it isn’t anything you have to play right away.